Payments as low as $75/mo. Or, apply & pay as little as $75/mo. I'm not normally one to play with a slide, but the moment I picked up this guitar I knew I had to grab one. 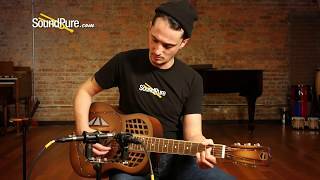 The classic twang you would expect from a resonator, a hefty beast with plenty of sustain. A tone complex enough to make even the most generic single note line roar to life. Appointments make the guitar look just as good as it sounds! In this video, Sound Pure guitar specialist Barrett Brooks tests out a National Triolian Tricone Reso-Phonic guitar. Our NRP Steel Tricone features the classic styling of the vintage Tricones but with a special sound. The tone of the steel body offers a deeper, darker voice — yet with more immediacy and presence. And it still boasts all the amazing sustain and rich choral tone the Tricones are famous for. The steel body and coverplate are plated and then hand rubbed with a vintage vibe. Inside, the NRP Steel Tricone features the same type of aluminum resonating cones and T-bridge as the original models. The mahogany neck features an unbound ebony fingerboard with dot inlays, while the traditional slotted headstock has “NATIONAL” stamped on it. If you’re seeking a Tricone with a bit more blues feel to it, the NRP Steel guitar has it in spades.